That's the sound of the future produced by the all-electric race cars at the Qualcomm Formula E (short for Formula Electric) race that was held in New York City last weekend. At a normal NASCAR or Formula 1 race, the sound of roaring engines and screeching tires can be deafening. Comparatively, the sound of an all-electric Formula E car is like the meekest chipmunk trying to mimic a jet engine. Attending one of these races is a surreal experience, as massively expensive racecars whip around the track in excess of 200 miles-per-hour in lanes no bigger than 10-feet-wide. Unlike the cars that drive the Indy 500, however, these cars make less noise than your blender. In fact, the track becomes unsettlingly, dead quiet as soon as the racing pack turns the corner. Despite how quiet a Formula E race is, it couldn’t be farther from being boring. Formula E races are held miniature street circuits so tight they can barely fit two vehicles side-by-side. Cars fly down straights before coming to a screech halt on hairpin turns. On lanes barely wide enough to even maneuver, 20 vehicles in total crowd around the corner as they bump into each other and glance off the wall, sending carbon fiber panels flying every which way. Formula E racing is frantic. It’s a far cry from significantly larger Silverstone and Indianapolis race tracks that Formula 1 and Indy car races are held on respectively. Comparatively, one could have three freight trucks drive around the ring with ease on these fatter circuits. You might've seen a NASCAR or Le Mans race or two in your time, but Formula E is a different beast. Like other events, racers have to be alert, making intelligent decisions behind the wheel while using lightning-fast reflexes to prevent crashes. But more impressive, to me at least, is just how much data drivers use on a second-to-second basis: As they drive around the ring, the steering wheel has a constant readout of exactly how much they have energy left. The pit crew and audience also sees this battery information in real time. Push it and they’ll have a better chance of being first, but then they also run the risk of puttering out on the track. And when drivers out of juice there’s no simple way of filling back up like you can with propane. No, the driver has to physically get out of their car and jump into a spare vehicle in the pits. Formula E has one big advantage over its louder gasoline sibling in that the cars can use regenerative braking to recharge batteries on the track. 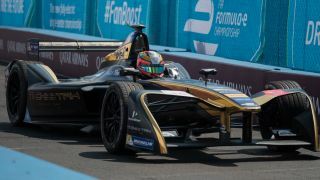 But this comes with an equally large risk of frying the car’s energy cells and simply breaking down on the track – which happened to more than a few vehicles during the two day NYC ePrix. These elements really add to the drama because the audience can see exactly how much energy each driver has left. I spent just as much time watching the driver make it around the track as eyeing the battery lives on the cars. The excitement hits a fever pitch as the last lap comes down to the last second and last pip of energy. Cars running on their last 5% of battery die left and right as drivers put everything into the final stretch. Formula E racing feels and looks like something out of F-Zero, and I hope it becomes the future of racing. Beyond the Rift is a new column where we take a look at emerging technology that's just beginning to sprout up in the world. We'll look at the newest tech like eBoards, eBikes, wireless headphones, 360 cameras and much more.